Real name and nationality not firmly established in Street Fighter. Height: 5'11", Weight: 254 lbs. See this page for M. Bison's depiction in the Street Fighter games, animation, and live action. Accessories: black laser pistol (88 Iron Grenadier's), black submachine gun (89 Annihilator's), black rifle (90 Rock-Viper's), neon green spring missile launcher with orange trigger (93 H.E.A.T. Viper's), two black missiles (93 H.E.A.T. Viper's), orange spring grappling hook on black string (93 Guile's), black figure stand (common). Never has a man been more cloaked in secrecy than M. Bison. Ever since he emerged to lead the international criminal organization Shadowloo, the world has been awed by the incredible power at his command. Seen as the master of evil, Bison rules over his empire with an iron fist. Preferring to let his underlings do most of the dirty work, Bison only unleashes his powerful psychic ability when absolutely necessary. 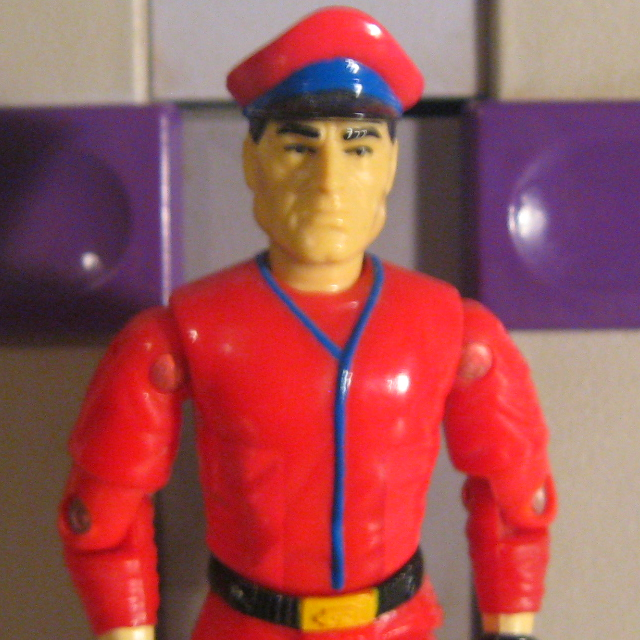 Unmatched in his power and agility, M. Bison reigns supreme as the greatest Street Fighter in the world. Motto: "Anyone who opposes me will be destroyed!" Variations: Some copies had a silver mantle (88 Road Pig's) glued on. Toy Notes: Featured in the Street Fighter commercial. Item #81084. Toy Notes: Boxed with a recolor of the Badger. Item #8201. 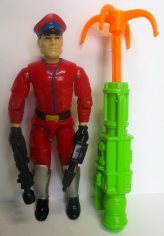 The prototype shown in the 1994 insert catalog has the head and hat of Gen. Flagg (92).